At this point, I’ve read several books on starting businesses and each of them follow the same formula that Patrick Henry uses in his book: you must first plan what you are going to do, do it (and commit to it), and you find success. 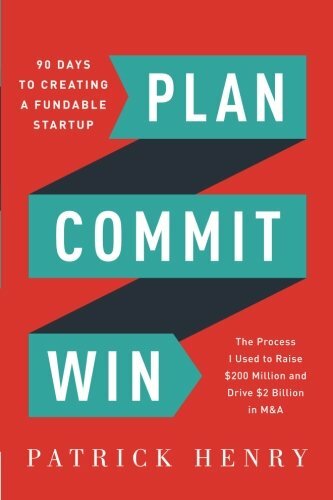 The main difference I found with “Plan, Commit, Win” is that Henry not only focuses on starting a business, but how to find and build relationships with investors complete with checklists and examples of how to talk to these investors. As with any of these books, there’s no promise that these techniques will work for sure, but if you are authentic, patient, persistent, honest, transparent, and calm, you will have a much better chance of making your business work. One of the things I love about books like this is taking entrepreneurial ideas and using them in an intrapreneurial way. I currently don’t own a business (and even the business I plan to own is a consulting firm), but these techniques can be applied to how I handle my current team and workflow. That said, my favorite aspect of this book is one of the shortest chapters in the book: Creating a Culture of Getting Things Done. The basic ideas of this chapter is that you must “plan the course,” “set milestones,” and “measure results.” While we do this, we don’t do this to the level we should and it is a good reminder that we should always have a plan to follow, goals to achieve, and a way to measure our progress. Henry states that, “You must also maintain a heartfelt belief that you can win and keep your team on board with that” (159). You should bias your team towards action (getting things done) while being flexible enough to course correct along the way. If you are currently planning a start-up, Henry’s story can help to inspire you. If you aren’t, the ideas and techniques can still inspire you to develop your team and career in new and different ways. “Plan, Commit, Win” by Patrick Henry will definitely be a book I come back to again for advice as I continue to develop my career.